HomeGet on the bus! End Immigration Detention! 24hr solidarity fast! Get on the bus! End Immigration Detention! 24hr solidarity fast! Call for 24hour solidarity fast with immigration detainees: In response to our call for a demonstration on the outside, immigration detainees in Lindsay will be initiating their own 24hr fast inside on December 14th, 2013. Because of this, we are now calling for a 24hr global solidarity fast to accompany the protest at Lindsay Jail. Details follow. 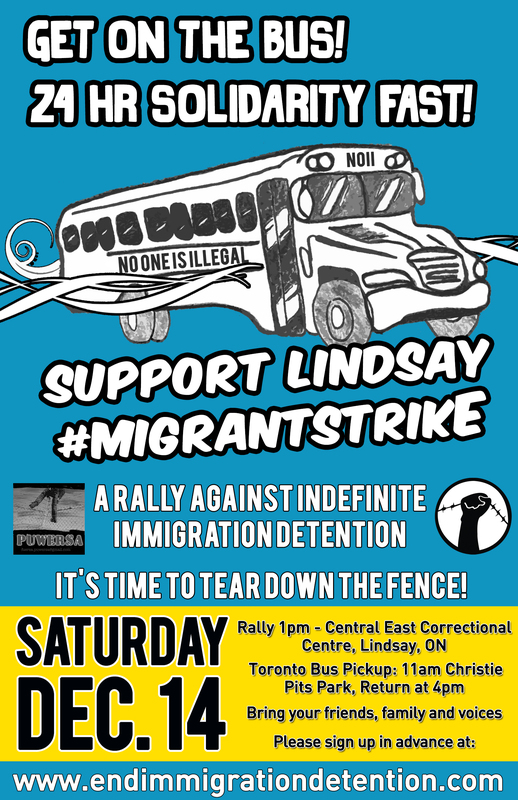 On September 17th, 2013, 191 migrant detainees began a hunger strike in Lindsay, Ontario’s Central East Correctional Centre. This was the largest immigrant detainee hunger strike in Canadian history. Representing 600 or more people held by Canada immigration on a given day, and representing up to a hundred or more held on a long-term basis, these men began fighting back. Demanding that they either be removed or released within 90 days of being detained, they inspired people on the outside to create the End Indefinite Immigration Detention Network. The detainees are also demanding an end to maximum-security incarceration and an overhaul in the detention adjudication process. Join us on December 14th in Lindsay, ON to support these calls – buses depart from all over Ontario. > Join the 24hr solidarity fast, 12:01am – 11:59pm, Sat Dec 14. Take a photo committing to participate in advance and email it to migrantstrike@gmail.com. See here for photos! The fences that surround these detainees are dividing them from their communities, their families and their lives. It is time for these fences to come down. Most countries in the world have a limit to how long they can hold someone in order to remove them, including the United States and the entire European Union. However, Canada is a rogue nation. Despite the United Nations directive stating that every country must have such a limit, Canada continues to hold migrants in jail for as long as ten years! Detainees are separated from their families, children and communities with no release in sight. These people are serving time on administrative grounds, namely their removal. If they have convictions, they have served their time. Deporting people after they have done their time is double punishment. Unlike people being held until a criminal trial, or serving time once sentenced, these detainees do not know when they will be released and face a bail or release process where they have to prove that they should be released. These detainees have said enough is enough. Release us after ninety days so we can return to our families, our jobs and communities. Many of the detainees stopped hunger striking (two remained on hunger strike for more than 60 days) after Canada Immigration placed strikers in the hole and removed organizers to other jails. However, the detainees remain defiant and plan further actions in the near future. They continue to demand that those in jail past 90 days be immediately removed, that they be moved to lower security facilities (at the CCEC they have a poor diet, little access to medical or legal or cultural specific services, little outdoor time and are on lockdown much of day) and that the entire adjudication process be overhauled. Join us in a show of support and solidarity on Saturday December 14th. Bring your friends. Bring your families. Bring your voices. For more information on the strike and detention of migrants in Canada, see http://www.endimmigrationdetention.com.